Description Sci-fi collectible card game. This new version of HD features new cards, additional gameplay modes and multiplayer. Controls In short you have to play structures which provide you with energy. This energy can be used to play ships and actions. Ships both defend your base and attack your opponent's base or ships. To defeat your opponent you have to bring their base HP down to zero. The cards at the bottom of the screen are available for playing. If you have enough energy to play them, simply click a card and a number of locations will light up on the board. Click any of those locations to place your ship or structure. Sometimes, actions do not require a target and can be cast right away. If a target is required, valid targets will light up on the board. Simply click the target of your choice. 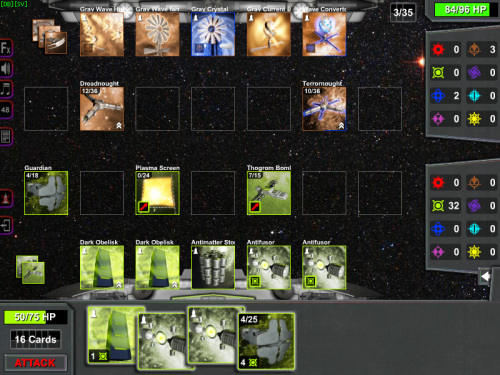 I like this scifi strategy card game.